This year’s theme is the Power of We. The Power of We is a celebration of people working together to make a positive difference in the world, either for their own communities or for people they will never meet half way around he world. That’s what we’re all about at the American Red Cross. Below are 7 examples of how you can be part of the Power of We. 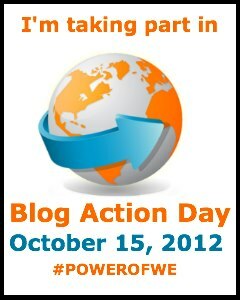 With these options, we invite you to not only participate in Blog Action Day but also to make a real-world impact today. If you’ve got additional ideas or take other actions, we’d love to hear about it in the comments. Even Oscar the Grouch might come around to the Power of We. It’s also National Grouch Day. Help map Uganda. More crowdsourced mapping projects are coming soon, too. Send a card of thanks and support to members of the Armed Forces, veterans, and their families. Sign up to volunteer! We have lots of options and a How To. Nothing says we’re all in this together like giving blood. Do it! Be ready to take action in an emergency. Take a CPR course. Want to stay on your computer? Search “red cross” “blood” on Twitter today and send a word of thanks to the people giving blood today.